Soccer Picks Up Another Win! It was early last November when Severn handed St. Paul's School for Girls its only loss of the 2017 season in a B Conference semifinal while preventing the Gators from a chance to win back-to-back titles. 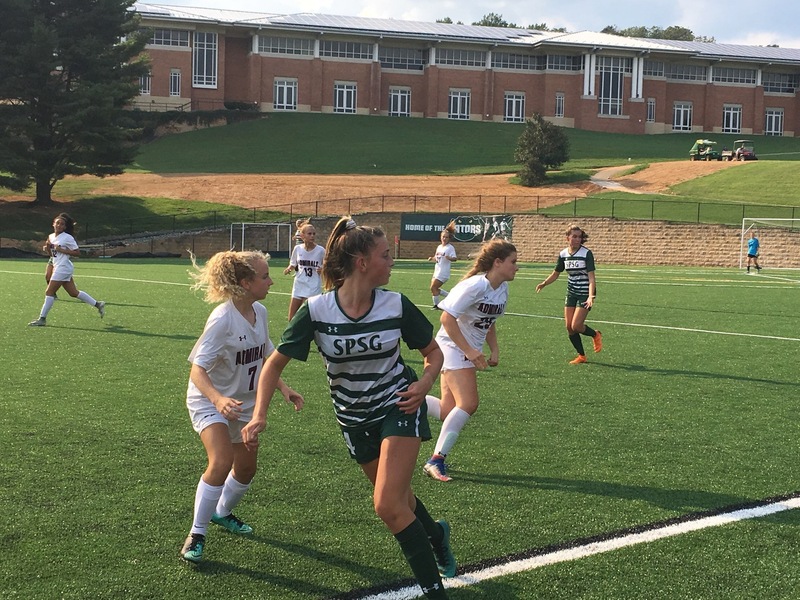 On Wednesday afternoon in Brooklandville at Levering Field, SPSG exacted a measure of revenge with a 4-0 victory over the Admirals, who are a much different — and way younger — team than the one that reached the conference final two years in succession under coach Albert Oni. St. Paul's, which has moved up to the A Conference this fall, was patient and precise throughout the match played on a sweltering afternoon with temperatures in the 90s that began with a threat of rain. The Gators pressed the action from the opening whistle, scoring in the second minute and again in the 10th on goals by junior Laney Cornelius. By the time junior Alex Pirisino gave the hosts a 3-0 advantage later in the opening period, Severn had yet to take a shot. That initial offering would come off the foot of freshman Sophie Fionda, who forced St. Paul's senior keeper Annie Schindler to make her only save of the game. Her counterpart, Leia Liberto, recorded 10 saves for the Admirals in only her second start between the pipes. Liberto is actually a field player who volunteered to play the position this year because the keeper position was vacant, Oni said. "She was very brave for stepping in there," Oni added. Junior Lizzy Pirisino converted a corner kick by Cornelius to make it 4-0 in the second half, ending all doubt about the outcome of the Gators' second match of the young season. St. Paul's coach Joie Gill said that she talked more about last year's loss the the Admirals than her players did. "I wanted to let them know that this was the team that knocked us out of the playoffs," Gill said. Regardless of whether that aspect of the rivalry actually motivated the Gators, they were sharp from the get-go. "We do a good job of coming out strong, making good decisions and not turning the ball over," Gill said about her squad. Cornelius said that netting her first goal helped to get things started in a positive fashion. "It put us in a good place and gave us momentum for the rest of the game," the center midfielder said. Oni said that the Admirals benefitted from "playing against a good team," which should help them compete in the B Conference this season, although they won't open conference play until Sept. 14 against Mount de Sales Academy. The Gators, who beat Catonsville High by a similar score over the weekend, will make their A Conference debut on Sept. 11 against St. Mary's.